Welcome to the pearl of South Bulgarian Black Sea coast, the ancient town of Sozopol! The sunny summer, the warm sea water, the broad and cosy beaches, breezy parks, restored hotels and the good service attract thousands of tourists from all over the world every year. Founded in the year 610 B.C. by the Greek settlers from Miletus, the colony called "Apolonia" is situated at a little rocky peninsula, flourished as a mediator between the world of the Greek and the world of the noble Thracian tribes. Today, that fascinating place is a large tourist center, remarkable for its unique stone and wooden houses, that date as far back as the 19th century. Some of them are even declared of being National Cultural Monuments. 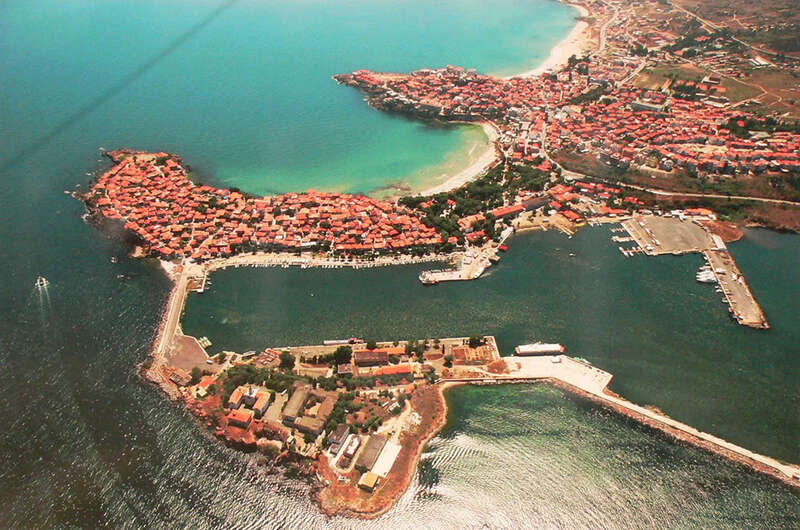 Sozopol is a historical settlement with a lot of landmarks dating back to ancient times, as well as to recent times. One of the most spectacular sights is the Sveta Bogoroditza church, which is located in the old part of the town. It dates as far back as the 17th century and half of it was erected under the ground, because the Turkish conquerors had imposed a ban on the erection of high Bulgarian Christian temples. Another famous landmark is the archeological museum, where tourists could take a look at a rich collection of amphoras, stone anchors and models of ships used by the Greeks, the Phoenicians and other ancient peoples that the population of Sozopol kept in touch with. Interesting monuments from the XVIII - XIX-th century are many houses, windmills, fountains, squares. The magnificent mediaeval achitecture, as well as the antique traces from different civilizations are unique opportunity for entertainment. It is not only them that attract tourists, but also the two beaches with fine sand and especially the local people's hospitality. In July and August Sozopol resembles a beehive, filled with tourists and during the winter, it turns again into a quiet and romantic fishing settlement. That seems to attract a lot of artists, writers, actors, etc. There are concerts going on all the summer featuring famous actors and singers. At the end of summer the National Festival of Culture "Apolonia" begins, known all over Bulgaria. Small restaurants and cafes are to be found along the coast, which tourists might visit to taste Bulgarian specialties meals of local mussels and dried mackerels, prepared in a number of different ways. On the other hand, these tiny restaurants have another advantage - the magnificent scenery they face - the offing and the port. The small port is the ideal place where one could take a look at the anglers, who demonstrate their skills of fishing. There are many taverns in Sozopol worth visiting. Some of them offer a program, which includes folk songs and dances. There are many family hotels and guest houses, which offer a whole range of modern conveniences at reasonable prices. The variety of hotels, restaurants, taverns, entertainment and night clubs transmute the momentary rest into an interesting and unforgettable experience. In the summer Sozopol is visited by a lot of Bulgarian and foreign tourists. For the guests there are especialy organized yacht tours, fishing, visiting places of amusement, tours around interesting historical and cultural sights in Bulgaria. The unique natural wealth of Sozopol - calm and warm sea, old forests descending to the beach, covered by fine golden sand, healing mineral springs, as well as thе wonderful conditions for rest, sports and entertainments, is the reason why thousands of tourists from all over the world visit the resort every year. Also tourist interest takes Ropotamo Natural park, who is located near to Sozopol. This is a territory, which include various natural ecosystems. There are deer, sea hawks and eagles, wild boars, wild cats etc. There are 3 species of tortoises in the river and some of those species grew to 35 cm. The mouth of the Ropotamo river is situated in the middle of the coast line stretching between the town of Sozopol and the town of Primorsko, about 40 km to the south of Bourgas. The river has a rich and unique variety of flora and fauna. The Ropotamo river is particularly famous for its tender water lilies. A boat trip down the river or a walk along its banks is an unforgettable experience.The fishing and the hunting in the region of the Ropotamo river are forbidden. Sozopol will be a pleasant and unforgettable experience for you! Please read hotel reviews, promotion, bookings and choose from our hotel list the best hotel deal for your summer holidays in Bulgarian City of Sozopol.